-- An awful lot of companies have tried to figure out how to make consumers want to stream Internet video in the living room. One of the few to have succeeded is Roku, whose cheap little boxes offer easy access to 1,200 channels of content, from biggies such as Netflix, Amazon and HBO Go to stuff you never knew existed. The company has sold 8 million boxes, which have been used to watch 1.7 billion hours of video to date. At this year's CES show in Las Vegas, Roku's big news is that it's going to be possible to watch those 1,200 channels without even paying for and hooking up that cheap little box. It's going to work with TV companies to build Roku TVs. Roku will design the entire interface, as well as the super-simple remote control; essentially, it'll be as if a Roku box sprouted a gigantic screen. This should be a really good smart TV for the average user. I did smile when I saw "cheap little boxes offer easy access to 1,200 channels of content". I know I can't load over 200 channels without slowing the box to a near standstill but there are not more than 50 channels I would ever use. At first, I just started adding channels, just in case I could find something to watch and at one time had around 200 channels added. I have slowly been deleting channels and will end up at around 50 when I am finished. The last two months, I have used ESPN3, nothing else with Roku but after my Netflix subscription is cancelled next month, it will be used again for other channels. Since buying the Chromecast and getting Netflix for 3 months, we watch Netflix and not much else but we use Google TV for Netflix. I hope Roku succeeds, it is doing a great job of focusing on a narrow market, easy access to internet streaming content. Roku works really well for what it does and every other product designed for that market is in real trouble in my opinion. I do not think that market will ever be huge but a big piece of a medium sized market is often a whole lot better than a tiny piece of a huge market. Having beaten out Apple TV as the most-used streaming set-top box in the United States, Roku is set to debut its own smart TV  called Roku TV. The Roku TV promises to get rid of complicated menus in favor of a simple television home screen offering all available content sources. 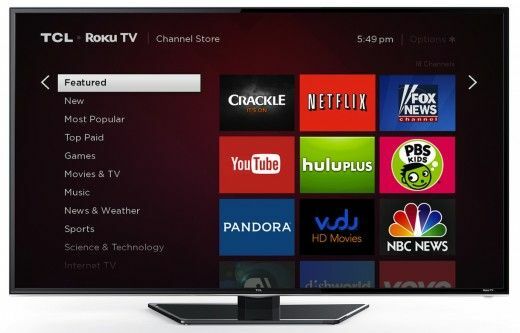 As with Roku streaming players, users of the television set will have access to the Roku Channel Store, which features 31,000 movies and 1,200 channels. The remote control to access this will also feature just 20 buttons  supposedly half those used in a traditional TV set  while the service can also be navigated via other sources, including Rokus iOS app. To roll out the Roku TV, Roku has partnered with TCL and Hisense  and the models will be shown at the Consumer Electronics Show later today in Las Vegas. The first Roku TV models will range from 32 inches to 55 inches, and will be available in major retail stores beginning this fall. My own personal preference is to buy a good 'dumb TV' - and then add the Smart TV features through an inexpensive set-top box. People generally like to keep their TVs for 5-7 years. The Smart TV processor these days tends to be 'outdated' in about 2 years. Plus there is always future update support to worry about - as well as the potential for more 'problems' with the TV. Just ask the first generation Sony GTV television owners. I think the TV manufacturers like the Smart TV features built in because it increases the profit margins on their TVs - as well as making it more likely the purchaser will buy a new TV set sooner (compared to if they bought a dumb TV). 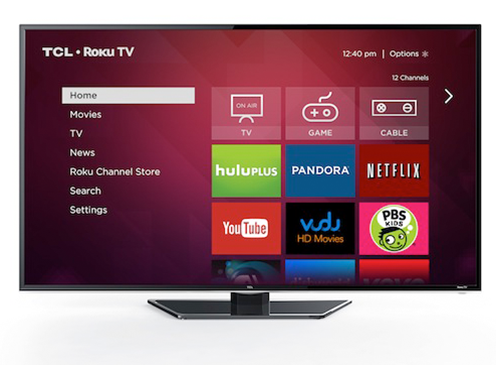 Today we announced Roku TV. Thats right, actual TVs, designed to give consumers a simple and powerful entertainment experience in todays connected world. Weve applied the same principles that have made Roku the most popular streaming players in America to TVs. Roku TV removes all of the complicated layers and menus, and unnecessary features and settings that plague smart TVs today, and instead provides a Roku home screen that brings together all content sources. Just like Roku streaming players, Roku TV will have full access to the Roku Channel Store filled with more than 31,000 movies and 1,200 channels that feature TV shows and live sports plus news, music, kids, food, science, tech, fitness, foreign language and other programming  more options than all the other Smart TVs in the market. Roku TV will feature just 20 remote-controlled buttons  half the number of traditional TVs  so consumers will only need to interact with the necessary controls. And speaking of controls, Roku TV can be navigated via mobile devices with the Roku app for iOS or Android as well as support casting standards including DIAL. To manufacture and distribute Roku TV, Roku is working with top global TV manufacturers including TCL and Hisense. Together TCL and Hisense shipped 21 million TVs in 2012, accounting for nine percent of the world TV market. Roku TV models ranging from 32 to 55 inches will be available in major retail stores starting this fall. Of course were still making our popular Roku players alongside Roku TVs. Now consumers will have a choice for how to get Roku on their TVs. This is big news, and a great way to kick off the year, but Id be amiss not to acknowledge that 2013 was also a year of many Roku milestones. We accomplished a ton in 2013 but were looking forward to accomplishing even more in 2014. With streaming on TV more popular than ever and terminology like binging and marathoning now mainstream verbs that have nothing to do with eating or running  its a great time to be a TV lover and its a great time for Roku. Every Smart TV or even Smart Blu-Ray player I have purchased has been a waste. Unfortunately it's getting harder to find good dumb TV's. My own personal preference is to buy a good 'dumb TV' - and then add the Smart TV features through an inexpensive set-top box. . So far, all I have used are dumb TVs but considering I am still using three year old Google TV technology, it wouldn't have mattered if I had purchased one of the Sony Google TV models. I don't have any real dislike for having the smart TV functions built in but I am inclined to think I won't be buying a smart TV anytime soon, if ever. Hey if I can make what I have work the rest of my life, I will just do that. It's too much to hope for.. but someone could define a card interface and we could at least have the "smart" module be upgrade-able... then and only then would I buy it partially integrated to the TV itself. Far too hard to find just a TV or just a "smart box" that you like... much less to have to find all of those criteria in the same piece of hardware. The Evolution kit only works with a few Samsung TV's, is really expensive and doesn't really bring a 2012TV to a 2013. Good idea in principle but it really seems to be a hopeless product. A Roku TV seems like a strange idea. The same with those Apple TV rumours. An inexpensive media player just makes more sense. The whole Smart TV, 3D TV and other schemes are just marketing ploys to get people to keep buying newer TV's. Given that broadcast quality seems to still be around 720p I don't think people will keep falling for the hype. LED is just LCD with different lighting. Thin means poor audio. Built in WiFi means a pain. All that is needed is a display. The rest should be independent. The i/o issue is really the weak link, apart from the crazy distribution model of entertainment. Nothing is happening in the living room that is interesting. Perhaps the XBox One. The ATV and Roku are worth the price depending on which world you are in. The GTV is a forgotten gem and Chromecast is a hobbyist project good for the 3 month free Netflix. I agree 100%! Roku upgrades their boxes every two years.Couldn't see paying extra when it's more money wise if you want to upgrade just purchase a new Roku unit on Black Friday every other year.I have the Roku 2XS and Sony GS7 hard wired and enjoy the crap out of both. Yes Roku and Google TV together are a great combination, covering about everything I want from streaming boxes/media players. If there was anyway Google could just buy Roku and load Roku on Google TV, users just click on the Roku app and viola, you have a Roku with all of those channels and easy internet streaming. Of course that isn't going to happen so I have two little streaming boxes on every TV. I must point out that the ATV and Sony GS7 work great together. I have my ATV plugged into the HDMI in port of the GS7. I then used the ATV to learn the remote signals from the GS7 and it all works great. The only tricky thing was the ATV menu key which functions as a back key. I had to use the lower left hand location of the track pad for that. Not ideal but it actually turned out fine. I like Apple TV also but it is third best for me. I don't have anything on iTunes and I don't have an iPhone or iPad but it is a solid little box. As you may notice, the UI is very similar to the existing Roku boxes, with the exception of added channel tiles for any of the TV's input devices. If you connect a cable box or an over-the-air antenna to your Roku TV, it essentially becomes a tile on Roku's home screen. The ability to shut down the TV and then resume where you left off is interesting, but I was told that this only works for any input devices, meaning you can resume live TV but not Netflix this way. Did I see Hisense in that image? Uh oh! Does this mean that the Roku TVs will depend on different manufacturers like GTV? This, to me, was the main flaw in Google's strategy. Is Roku about to make the same mistake? The streaming box makes sense & is highly successful mainly because it is a separate unit from yer TV. Merging the twain may not prove to be a wise approach. Who wants their TV experience dominated by Roku? Roku will still have the little hockey puck boxes, this is just expanding their market to cover the consumer that wants the smart TV applications built in to the TV. I think the separate box will still be the big seller and I consider it a good move to serve both markets. 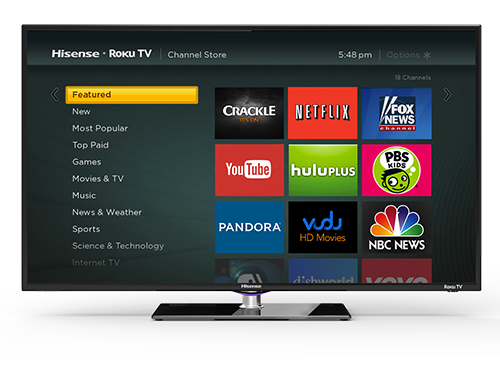 Hisense is a major manufacturer of TVs so Roku definitely wanted Hisense on board with the plan. I will guess Hisense, TCL and Funai will combine for more than 50% of LCD TV manufacturing in 2014 so Roku wants all three to have the ability to include Roku built in models at their manufacturing facilities. Companies are going to keep trying to integrate smart features in to TVs directly, because it's so difficult to do seamlessly with a 3rd party box; and that's what the market want most - seamless - easy to use - fast - painless - etc.